All we do at Amoeba is listen to music and talk about music. Take advantage of how nerdy we are with this comprehensive best-of list from the year, which compiles new records from the best albums of 2014 lists made by Aaron Detroit, Brad Schelden, Oliver/Matt/Jordan, Billyjam and myself (click to see invidividual lists). 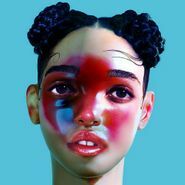 FKA Twigs LP1 was one of those cross-genre, unclassifiable albums that everyone seemed to love. Not only the best debut record of the year, perhaps the best, period.